Offers: Open Fairways discount card; 2fore1 vouchers; Plus various club offered discounts including Day Rates and Golf Breaks (accomodation & golf). Hotel, Conference Centre, Country Club, Golf Clubhouse, Professional Shop. Golf Practice Facilities including 6 hole Academy Course. Hawkstone Park is a venue few can rival. It’s more than a hotel. More than a golf club. More than a visitor attraction. The setting for Hawkstone Park’s two 18 hole championship golf courses and 6-hole Academy course could hardly be better. Hawkstone Park is an English Heritage Grade I landscape and was recently voted one of the top 20 golf holiday destinations in the world. The three courses were designed in extensive parkland surrounding the ruins of a medieval castle, with the cliffs of the world-famous 18th Century Follies providing a spectacular backdrop. Hawkstone Park boasts two genuine championship courses. The Championship is a par 72, 6763-yard championship course designed by former Ryder Cup captain Brian Huggett. Brian has introduced many American-style features into his design, such as oval tees, rolling fairways with mounds and good use of water features. In common with the Hawkstone course, its signature hole is the par 5 10th. The fairway curves round the lake, providing a difficult dog-leg – and the challenge of reaching the green over the water in two. 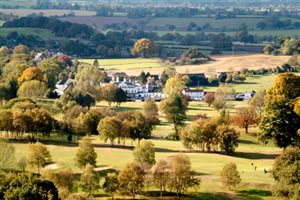 Formerly known as the Windmill, the Championship course was opened in 1995. Visitors are always assured a warm welcome.